We offer the Higher Quality, Higher Grade 16" (inch) "7 Function" L.E.D. Foam Sticks. These obviously have better L.E.D. interior parts and a better lighting effect as well as they are the most durable and re-usable. Batteries are also replaceable on these. MINIMUM CUSTOM ORDER IS 50 UNITS. Get your party going and your crowd hype with the strobe function or set a calming mood with the morphing colors of red, green, and blue. These Foam Sticks are used in all the mega clubs in all the large cities all over the world, these are the 16" inch LED FOAM STICKS. With This LED Foam Stick, Glow Batons multifunction lighting, you’ll be able to control the vibe of the room and crowds love to pump these in the air when their favorite music is playing as well as dance with them. Great not only for the club scene, but for social activities like concerts and sporting events as well as for Halloween and New Years. 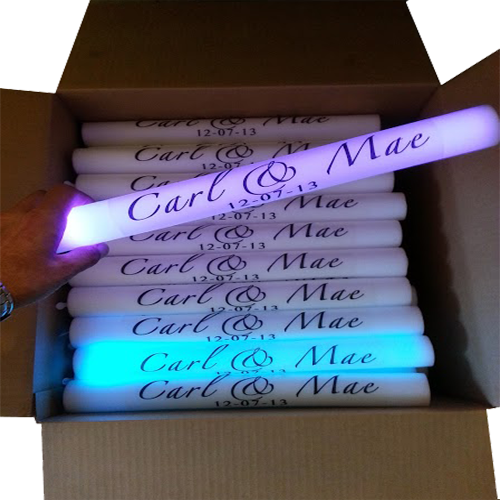 These "LED FOAM STICKS" are 16” long and 1.5” wide, the "LED FOAM STICKS" are the ultimate hand held party tools and great for giveaways or income generators. AREA TO USE IS 8 Inches wrapped ALL THE WAY AROUND. JUST ADDED CUSTOMIZE YOUR FOAM STICKS FOR ANY PARTY. CAN BE DONE IN COLOR OR BLACK AND WHITE. WE WILL EMAIL YOU A PROOF WITHIN 24/48 HOURS. 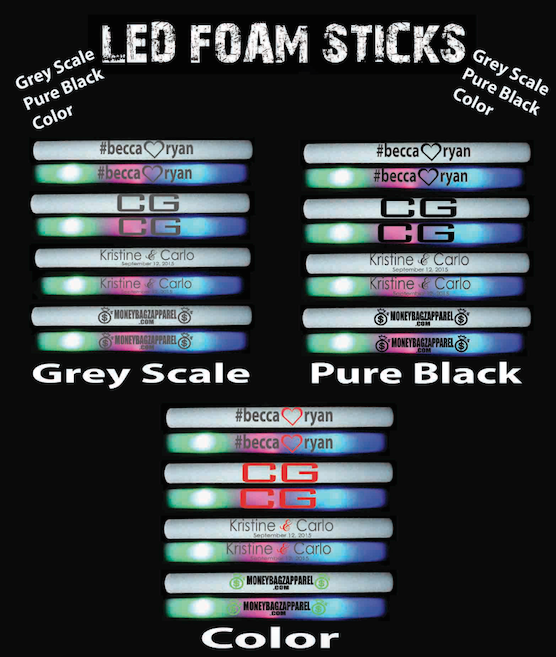 The 16" LED FOAM STICK's are 7 Function RGB, These Foamies or Foam Batons, Glow Wands, a.k.a. LED Sticks,are a bit higher quality in Construction and withstand a bit more in handling, and more rugged and rougher conditions.They overall tend to last longer because of their build and construction. The interior electronics are a bit more elaborate and higher quality than the 18" counterpart because these LED FOAM STICKS actually "MORPH" from SOLID color to SOLID Color and have 7 Color Changing Functions in which it will change from solid colors, to Blinking Solid Colors, as well as 2 Multi Color Functions where it goes wild with all the colors at once or automatically changes solids. These 16" LED FOAM STICKS are more common for Weddings and Corporate Events, For establishing Brand recognition and Higher end events. LED FOAM STICKS for Brand recognition and promotions! After all , some of the best memories are made at all of these activities, and with a branded one of these LED Foam Sticks, the memory of it is sure to engrave even the promotional efforts or names into your memory, fulfilling it's duty while everyone has an unforgettable time! 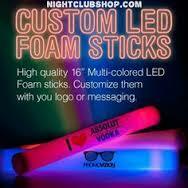 LED Foam Sticks come in 2 different sizes, each of different function and quality. PLEASE CALL IF YOU NEED RUSHED. With all of the LED FOAM STICK Orders that come in, we have one of the Fastest Turnaround and Production times in the business, Trust Nightclubshop to deliver your LED FOAM STICKS on Time. We also RUSH PRODUCTION SERVICE With a Small RUSH FEE Available for a Faster Turnaround and a faster Custom Process for those last minute orders. WE HAVE CHANGED OUR PRINTING PROCESS TO GREYSCALE BLACK instead of 100% BLACK PRINT on the CUSTOM PRINTED LABELS AND LED FOAM STICK CUSTOMIZATION. 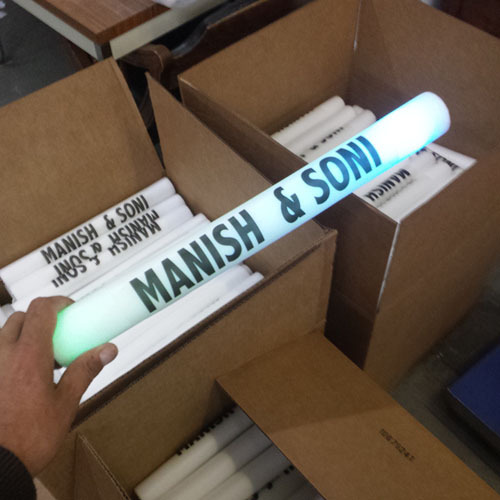 Make your company events stand out with these 16 inch LED high quality foam sticks. This will bring a sense of professionalism and will increase engagement with your target audience. They will be impressed when they see the show that these foamsticks will put on and how effectiveley they can spread your message. Show appreciation to your investors and employees by displaying your dedication to the company in the form of in depth details that you have planned out for your event. Excellent customer service, great product, fast delivery. Quality and Consistency, always come thru for us when we need them! These are perfect for your wedding or any other type of party. The 7 function lighting is pretty cool and definitely separates this item from the rest of them available. They arrived very promptly and I can't complain at all about the service. I ordered lastminute 16' foam sticks. Process was fast simple and very quick.under the recommendation of Alex I purchased the 16' instead of 18' because they were better quality. The light was working all party long so i was very happy. Although i was under the impression that the printing was in black, but it isn't the companies fault cause the proofs were sent in greyscale.